In case you’ve been wondering, pixies are green, frog-like creatures with wings. But you have to be a witch to see the wings. Seriously Wicked contains all the classic elements of a good commercial novel: a plucky protagonist with a quantifiable goal, friends in peril, an able ally, an antagonist who knows too much, complications aplenty, high stakes, and a ticking clock. This one also has at least one seriously evil witch and a really sympathetic dragon named Moonfire. There are also star-crossed lovers, Camellia, our narrator, and Devon, the new boy. Their meet cute involves a goldfinch and a flaming phoenix feather, which might be a first in literary history. Seriously Wicked reads a bit like Harry Potter lite, but Connelly has developed her own taxonomy of elementals, witches, and spells, and a delightfully relatable alternative witch-world, whose residents rely on items like dragon tears, werewolf hair, goat blood, and elf toenails for their spells, and on WitchNet and Witchepedia for much of their information. While you could read Seriously Wicked as an allegory about the demon in each of us and what we would sacrifice to save humanity from annihilation, it’s more fun to sit back, suspend disbelief, and enjoy the dilemma of a high school girl, imprisoned by a witch named Sarabine, who has summoned a demon that inadvertently gets trapped inside Devon, Camellia’s crush. Sarabine casts a spell, commanding the demon to accomplish a series of tasks, including locating a phoenix stored somewhere on the high school grounds in order to control its supersonic explosion, which is timed to coincide with the Halloween dance just days away. Camellia must find a way to stop this. There’s more. Much more. If Seriously Wicked suffers from anything it’s a slightly overcomplicated plot. It is so convoluted (although clearly well thought out) that Connelly inserts summaries periodically to help the reader out. The narrative bogs slightly toward the end when the clock slows so that all the answers Connelly has withheld (Why does her friend Sparkle’s nose keep changing? Why aren’t Camellia’s real parents looking for her?) can be revealed in a flurry of expository dialogue. Great. But at this point readers might really just want to know if the town is going to blow up and whether Devon will be restored to his former “boy-band” self. But there are deeper issues to consider here: What would you do if someone whose beliefs diametrically opposed yours were driving your life? How does one choose between competing desires in a moral dilemma? Camellia insists that she is not a witch. And yet, in order to save the school, her friends, Devon, the town . . . she must learn, and successfully cast, a very powerful spell (and, meanwhile, not flunk her algebra test). This is a fast paced, entertaining drama that offers readers the chance to contemplate the difference between good and evil, right and wrong, selfishness and compassion (as well pondering the current color of their auras). 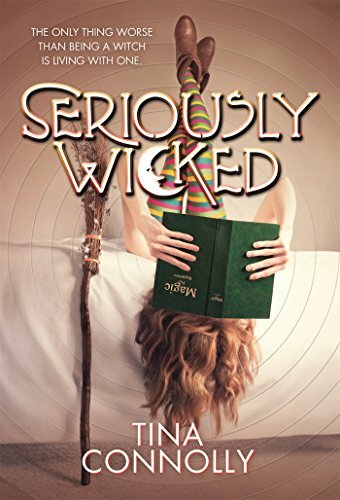 Connelly supplies a satisfying ending for readers of Seriously Wicked, and some bonus material if you want to try casting your own spells. Before you do, you might want to brush up on your math.